Upon his timely and historic visit to the United States, Ecumenical Patriarch Bartholomew eloquently expounded on the relationship between Orthodox Tradition and culture in an address which he presented at his convocation and conferral of the Doctor of Divinity degree on the occasion of the 60th anniversary of Holy Cross School of Theology in Brookline, Massachusetts on October 30, 1997. His message, titled “Pure Orthodoxy: A Question for Our Times,” addressed many crucial issues relevant to the situation of our Church in America. 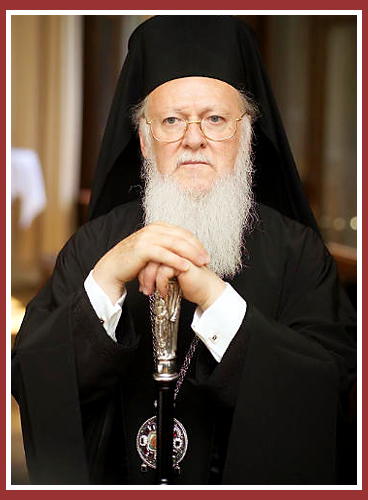 Below is this speech given to the students and faculty of Hellenic College/Holy Cross School of Theology. This gathering in mutual honor gives to our Modesty an opportunity to address, in love, a few fatherly words about the need to preserve the pure truth of Orthodoxy in this country and in our contemporary age. In America, just as in a great melting-pot, cultures and religions blend in the search for a new synthesis and faith, manufactured by man, and wrongly hope that it will unite all people around it, and will set us free from religious divisions and opposition. As we have said, Orthodoxy is a lived truth. This means that it is lived dogma. The Brother of God, Iakovos, writes about this in his Catholic Epistle, when he says “show me your faith by your deeds.” That is, deeds reveal belief, not as an abstract concept, but as genuine content. For of one sort are the deeds of a believing Orthodox, of another sort are the deeds in the example of Hinduism. Consequently, the deeds of Orthodox Christians reveal the careful observation which is the content of our faith. We are not speaking about sins and failings, to which we incline out of weakness; we are speaking about works in accordance with our attempts to do what is right. For example, the way of chanting in the Holy Churches reveals eloquently if the faithful give a greater significance to contrition or to aesthetic enjoyment. Likewise, the manner of iconography reveals if greater importance is given to the natural light, or to the uncreated light which illumines the saints from within; to the natural condition and natural comeliness, or to the supernatural beauty, for which we are reaching. The manner in which we arrange seating in Church manifests our right worship, or our excessive concern for comfort, and so on. Because of this, the Orthodox Church, aside from Her basic teaching, which contains the Symbol of Faith [Creed] and the sacred Catechism, does not demand from the faithful a hair-splitting concern with Her dogmatic teaching. Rather, the Church dissuades the majority from doing so because of the danger of misinterpretation and error. However, the Church preserves the dogmatic teaching unalloyed with great care, and calls that teaching to mind, when She sees an erroneous way of life being followed, which reveals a faulty understanding about the truth, that is, a faulty understanding about the realities such as our Lord Jesus Christ, Who is Himself the Truth, or the Church, which is the Body of Christ. In these circumstances, the Church reveals by the Holy Spirit the correct dogma, the correct truth, so that She might teach the correct life and give peace to troubled souls. Orthodox Christians who live in a country where full religious freedom reigns and where adherents of various religions live side by side, the country of the United States of America which has been so hospitable to us, constantly see various ways of living and are in danger of being beguiled by certain of them, without examining if their way of life is consonant with the Orthodox Faith. Constant vigilance and constant watchfulness are needed, especially by the shepherds, who are particularly responsible for the protection of the Orthodox inheritance of the faith. Already, many of the old and new Orthodox, who with zeal are deepening their understanding and living of the Orthodox truth, are stressing a continually expanding tendency of secularization, that is, a tendency of judging ecclesiastical subjects and problems by worldly criteria, with a debasement of ecclesiastical criteria. They are also stressing, from ignorance, a substitution of specific and general Orthodox dogmatic positions and understandings, with Protestant and Roman Catholic ones, as in the case of an overvaluation of personal opinion, indifference to dogma, and recrimination at the expense of character or practical virtue. They also stress many extraneous liturgical customs out of an ignorance of the rich symbolism of each liturgical action and its deeper meaning, with the result that they become, in certain instances, arbitrary and altered. The subject of the quality and faithfulness of the translations of ecclesiastical and liturgical texts into English that are being used requires special attention. Already one can note that in many instances, not only are these inferior, but they are seen unconsciously introducing wrong beliefs and even heretical notions into Orthodox worship. The conveyance of subtle and precise meanings of sacred texts and of the poetical hymnology of the Orthodox Church into another language is a most difficult task. Even the best knowledge of both languages is not enough. It demands holiness of life, for only then does the translator enter into the depths of divine meanings and is able to convey them faithfully into another language. It is sufficient to observe that only Saint John Chrysostom abbreviated the Divine Liturgy of Saint Basil the Great, that Saints Cyril and Methodios successfully translated sacred texts into the Slavic language, and after them, holy persons successfully translated other texts into other languages. Many of the Saints translated into new languages hitherto untranslated ecclesiastical terminology and thus enriched these languages with thousands of new foreign words from the Greek language. The ecclesiastical language of the prototypes is poetic, lofty, rich, deep and draws those who hear it to spiritual ascents, to a place where the sacred and wondrous mystery is perfected, where the Most High Triune God is worshipped. It is not fitting that this worship be rendered prosaically into the usual everyday language, but through a subtle and exalted clarity, be rendered in such a way that the hearer is transported to another reality, to another higher world. Besides, the whole performance of liturgy aims at this mystagogical elevation to the Throne of God, before Whom the Trisagion Hymn is sung with the Cherubim. The amazement at the sacred vestments, the contrite psalmody, the fragrance of the incense, the environment of the Church decorated with sacred figures, the unique quality of the architecture - all these things transport us to the other reality, [which is] the Church. Within all this sanctity, we ought not use everyday language, which brings us down once again to earth. We know that many will say that the meanings of the prayers, the troparia, the readings and the rest of the liturgical texts must be understood. In principle, this is correct, but that which hinders understanding is not so much the form of the language, as much as it is the lack of familiarity on the part of the hearers with the meanings of our faith. Not a single text is comprehensible without familiarity by the reader and the hearer of its content. Impoverishment not capable beyond only certain limits, will little support the understanding of a musical or medical book. That which is required for the unfamiliar is a simplified expression. In the Orthodox Church this ought to be done through preaching, through study and through similar means, and not through the enfeebling popularization of sacred texts, for its own sake. Besides, as we said, these texts call us and ought to remain invitations to ascend. Through all of this, we do not take sides against translations. Rather, the Orthodox Church has always recommended that the people be taught the faith and worship God in their own language. We draw your attention, however, to concern over quality, dogmatic exactitude and a loftier language for translations. Another subject, in which special attention is required, is the subject of the mixture, sometimes, of different local traditions with Orthodox Tradition. As is well known, the Orthodox Church came to America through immigrants, who brought to America at the same time their Orthodox Faith and their local or ethnic traditions. We respect these traditions and we congratulate those who make an effort to preserve them. However, we must distinguish them from the Orthodox Tradition. This has a special significance for those coming to Orthodoxy from other Confessions, who do not relate with the country of provenance of the community in which they are enrolled, for they have no obligation to follow the local traditions of the national provenance of the community, but only those of Orthodoxy. This certainly does not mean that the other members of the community are deterred in any way, rather we encourage them to preserve the traditions of their people. As regards, however, to our people we encourage them to keep the beautiful traditions of our race. This simply means that whatever traditions do not relate to Orthodoxy, but to other parts of our life, ought not to be imposed on the newcomers as a so-called part of Orthodoxy. For example, ethnic choirs of different Christian peoples ought not to be imposed as an obligation on our brethren committed to Orthodoxy of another nationality. The offering [of this example] of our brothers and sisters brings us to another serious spiritual problem, which we ought to face. It is the problem of the suitable reception and instruction of those coming to Orthodoxy from another dogma or religion. As is known, Orthodox ecclesiastical communities were established by groups of immigrants of a certain ancestry, with the purpose of serving them and their descendants. The Orthodox Church is open to all, however, for it has pleased the Lord in these latter days that the seed of truth should bear much fruit in the hearts of many non-Orthodox, who are returning to the Mother Church. We must prepare how we are to receive them suitably. The fitting manner of their reception has many wrinkles, from problems of language to their meeting in love, from the knowledge of their peculiarities, the remains of their former beliefs and mentality, and adapting to their needs for catechism and preaching, to their correct living out of the practical consequences of being Orthodox. This issue is serious and large and will be faced henceforth more frequently. For this reason and without setting forth solutions at this time, we propose that this occupy you seriously and that it occupy you continuously. The aforementioned do not mean that these problems exist in all the parishes, or that they have impact everywhere. However, they do comprise a cautionary note for all of us to be vigilant about. This vigilance is the command of the Lord. The Lord said “watch and pray that you enter not into temptation,” meaning surely temptations as regards the truth, which temptation is significantly more insidious. For usually, all of us notice the temptation to sin, and perchance we fall, we repent, are confessed and are restored. But if we fall into the temptation of error as regards the faith, with great difficulty can we discern it, and sometimes we remain in our error, rejecting the suggestion that we return to the correct path. There is, therefore, a great need in these critical times, that we watch, so not to fall into the temptation of error concerning the faith, or a further course away from our faith. In this matter, the responsibility of the professors and students of this Theological School is even greater. For they have the necessary means and are able to note the stealthy insinuations which find their way into Orthodox teachings and life these days, even that which is written from a non-Orthodox perspective. It is not right for our newly-enlightened brethren, full of zeal, to point out such issues, before we have done so ourselves. We hope that it will be a joint effort on all our parts to remove every inimical and worldly effect from our Orthodox Faith, and that the Orthodox Faith may be preserved pure and unalloyed in America. We close our talk with our heartfelt paternal and Patriarchal prayer that we see our faith be true to itself and untainted, and that those who labor in this work may have the blessing of our Lord Jesus Christ. May His grace, and the infinite mercy of the Father, and the illumination of the Holy Spirit be with you all. Amen.